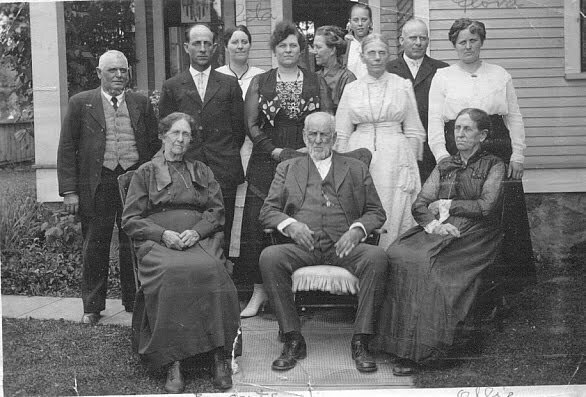 The Sam Webb family was one of the oldest and most prominent pioneer families in Cheney. Webster Webb was the father of prominent Cheney resident Samuel Webb. He had been a prosperous miner in Montana, farmed in Illinois and had come to Cheney with his family on the first train there in 1882. He bred Clydesdale Horses that he had brought with him. Webster and Etta Webb purchased the Sterling-Moorman House in August 1892. Samuel Webb was born October 7 1876 in Pony, Montana. Sam would grow up in Cheney along with his brothers Charles, Alva, Henry and Theodore Webb; and his sisters Nelli, Nettie and Amanda. Sam Webb married the love of his life, Flora Stroup who came from another prominent Cheney family, and they had one son, Carroll Webb. Sam also was a prosperous businessman, having brought the first freight line in Cheney. It was housed in what had been the electric train station at Second and College Streets. Sam was an avid gardner and both rooms in the station were filled with his plants. He also operated a successful freight line and passenger service until more sophisticated businesses took over. Sam also dabbled in politics, serving as the Republican representative for the 4th district in the Washington State Segislature from 1929-30, and served as County Commissioner from 1930-36. Sam was at Flora's bedside until she passed on in 1958, and he too joined her a few months later in 1959 at the age of 83. Sam is in many ways the typical example of the pioneering spirit that made Cheney what it still is today. Nellie is in the front row left-side. Nellie Mae was born April 25, 1873 Pony, Montana. She was 10 when Webster and Annetta came to Cheney. She married Frederick Reuter April 18, 1899. He was a very accomplished dairy farmer, and opened and operated the Cheney Creamery cheese factory. They had five children: Ruth, Dorotha, Frederick III, Gladys and Clarence. She often took care of her children and would make quilts. The big event for the family was the 4th of July picnic at Medical Lake. She would sometimes help her husband Fred at the candy shop he opened in later years, and she was very helpful working with the Red Cross as a nurse in both the First and Second World Wars. After surviving cancer she passed away in November 27, 1953 and laid to rest in Fairmont Cemetery in Spokane. Frederick Reuter was born in Avoca, Wisconsin January 15, 1871. His parents had emigrated from Germany and Fred learned how to make cream and cheese from them. He graduated in 1892 from the University of Wisconsin with a life diploma in dairy farming. He married Nellie Mae Webb in 1899, and opened the Cheney Creamery cheese factory which was very popular and made the best cheeses in the region. He was forced to give it up for health reasons; he later served as Cheney postmaster for 8 years during the Great War, and also operated a candy shop with help from his wife Nellie. He also worked for the Cheney Police Department for 9 years before retiring in 1951. Frederick died February 15, 1961 in Everett, and was cremated and interred with his wife in Fairmont Cemetery in Spokane.